The recent slowdown in productivity growth in the US, the EU, and in other developed economies has generated a sense of urgency among policymakers to identify impediments to productivity increases, and to find ways to spur economic growth. A number of explanations have been put forth. Falling productivity growth has been associated with rising misallocation of resources and large differences in productivity across firms (Bartelsman et al. 2013, Gopinath et al. 2017). Because companies vary widely in how much output they produce per unit of capital and labour, the EU does not grow as much as it could if resources were allocated more efficiently. Although a key objective of the EU has been to improve the allocation of resources across member countries, it is not a single market where marginal products for firms in all 28 countries are equalised. A less demanding proposition would be to ask whether after decades of economic integration the dispersion of productivity in the EU is close to the dispersion found in the US. In recent research, we show that the dispersion in the use of resources among EU firms is large (Gorodnichenko et al. 2018). Our results show that this dispersion is about 50% wider than has previously been found for the US (Asker et al. 2014, Bartelsman et al. 2013). We develop a simple dynamic theoretical framework of profit maximising firms, and estimate the dispersion of the marginal revenue product of capital (MRPK) and the marginal revenue product of labour (MRPL) in the EU and individual countries.1 Our calculations suggest that reducing the EU dispersion in marginal revenue products to US levels – a change that would likely require many significant policy reforms – could increase the EU’s GDP by more than 20%. By reallocating capital and labour to firms that perform better, EU economies could increase productivity and output. While previous research has been successful in measuring the dispersion of productivity and assessing potential gains from better allocation of resources, little is known about why firms have different marginal products. The lack of research on this question is due to data limitations. To explore why the marginal revenue products vary across EU firms, we use data from the EIB Investment Survey on a random sample of firms matched to an administrative database in each of the 28 EU countries. Using firm characteristics, in addition to industry-level and country-level variables, can help explain the dispersion in the use of capital and labour (Figure 1). Our results indicate that removing barriers across countries and industries in the EU (controlling for the interaction effects of country and industry in a regression framework) could increase GDP by at least 18%. If one considers that country or industry fixed effects capture barriers and distortions, then the EU common market is rather fragmented. In terms of labour allocation, firms appear to be more segmented across countries than industries, as the differences in the levels of MRPL are higher across countries than across industries. This suggests that moving a worker from one country to another is ‘costlier’ than moving the worker from one industry to another within the same country or that quality differences across workers are larger between countries than between industries. The opposite is true for the use of capital – the interpretation is that moving a unit of capital from one country to another is cheaper (or easier) than moving it from one industry to another within the same country or that quality differences in capital are smaller between countries than between industries. National regulations and language barriers could play an important part in the efficiency of resource allocation within the EU. Notes: The figures show the dispersion in MRPK and MRP among EU firms in different countries. ‘Raw’ means no controls. 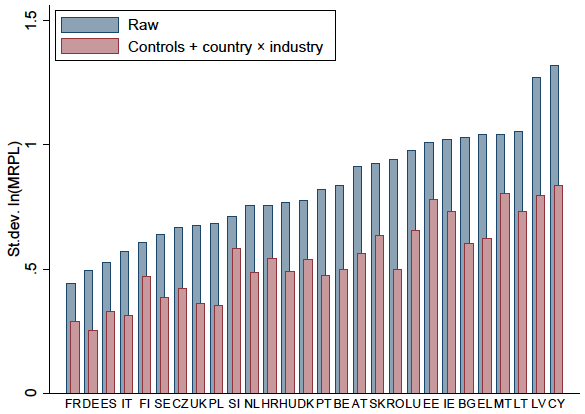 ‘Controls + country × industry’ add country × industry (interactions) fixed effects to firm-level characteristics. Country codes: AT-Austria, BE-Belgium, BG-Bulgaria, CZ-Czech Republic, CY-Cyprus, DE-Germany, DK-Denmark, EE-Estonia, EL-Greece, ES-Spain, FI-Finland, FR-France, HR-Croatia, HU-Hungary, IE-Ireland, IT-Italy, LT-Lithuania, LU-Luxembourg, LV-Latvia, MT-Malta, NL-Netherlands, PL-Poland, PT-Portugal, RO-Romania, SE-Sweden, SI-Slovenia, SK-Slovakia, UK-United Kingdom. While the existing literature treats the dispersion of marginal products as reflecting barriers and distortions, this may not always be the case. If the dispersion is due to barriers and distortions, it is indeed economically undesirable. However, some dispersion may reflect optimising behaviour of firms (e.g. compensating differentials in the labour market), which would be economically rational from the standpoint of the firms and could even be optimal for social welfare. Which of these phenomena is consistent with the data is thus a key question. We explore the extent to which firm characteristics predict the variation in MRPK and MRPL. For example, an older firm with a dated capital stock may be less efficient than a newer firm with state-of-the-art technology and recently acquired capital. Higher capacity utilisation is also associated with higher marginal revenue products. When we constrain the effects of firm-level characteristics to be the same in all EU countries, they can explain 11.2% of the variation in MRPK, and 27.1% of the variation in MRPL – a sizeable part of total dispersion. When we allow the effects of these variables to differ across countries, so that the effect of a rise in capacity utilisation influences the productivity of a German firm differently than an Italian firm, they can explain most of the variation in marginal revenue products. For illustration purposes, we group firm-level variables into two groups. In the first group, we include capacity utilisation, measures of input quality and indicators for the dynamic adjustment of inputs – we interpret this group as compensating differentials because they could reflect individual firm policies. The second group includes firm demographics (a firm’s age, size, subsidiary status, exporter status), obstacles to long-term investment, and source of investment finance, which we interpret as constraints and distortions because they reflect predetermined factors and business environment. In the regression analysis, the predictive power is similar for the two groups of variables. Conditional on accepting this classification of variables, one can reach two important conclusions. First, the raw dispersion in marginal revenue products is likely to overstate the extent of misallocation since some variation could be driven by heterogeneity in the quality of inputs. Second, distortions are likely to be substantial and removing them may lead to significant gains in productivity. Although we do not have an unambiguously exogenous variation in the firm-level explanatory variables, their predictive power sheds light on what factors are likely to be important and where future work should concentrate efforts to estimate causal effects. cross-country differences in how the business, institutional, and policy environment guides the allocation of resources across heterogeneous firms (i.e. how regression coefficients on characteristics are ‘priced’ into outcomes). We find that cross-country variation in the dispersion of marginal revenue products is largely driven by differences in a country’s business, institutional, and policy environment rather than by differences in firm characteristics per se. This result is important because it provides large-scale microeconomic evidence that institutions can explain the variation in marginal revenue products across EU firms. Notes: The table reports actual and counterfactual dispersion of marginal revenue productsbased on regression analysis. We use Germany and Greece as an example—the exercise could be done for any country pair included in the sample. Using the example of Greece and Germany, we show that the dispersion of marginal revenue products is wider among firms in Greece than in Germany (Table 1). However, the results suggest that if German firms were to be moved to Greece, they would not be more efficient than Greek firms – the dispersion of marginal revenue products for German firms would be even wider than the one actually observed in Greece. The Greek business, policy, and institutional environments seem to be relatively ineffective in reducing the dispersion of marginal returns across firms. Instead, if Greek firms were to be moved to Germany, they would be almost as efficient as German firms – the standard deviation of this counterfactual distribution is much closer to the actual distribution of marginal revenue products in Germany. In other words, the German business, institutional, and policy environments appear to help improve the equalisation of returns across heterogeneous firms. Asker, J, A Collard-Wexler, and J De Loecker (2014), “Dynamic inputs and resource (mis)allocation”, Journal of Political Economy 122(5): 1013–1063. Bartelsman, E, J Haltiwanger, and S Scarpetta (2013), “Cross-country differences in productivity: The role of allocation and selection”, American Economic Review 103(1): 305–334. Gopinath, G, S Kalemli-Ozcan, L Karabarbounis, and C Villegas-Sanchez (2017), “Capital allocation and productivity in South Europe”, Quarterly Journal of Economics 132(1): 1915–1967. Gorodnichenko, Y, D Revoltella, J Svejnar, and C T Weiss (2018), “Resource misallocation in European firms: The role of constraints, firm characteristics and managerial decisions”, NBER, Working Paper 24444. Machado, J A F and J Mata (2005), “Counterfactual decomposition of changes in wage distributions using quantile regression”, Journal of Applied Econometrics 20(4): 445–465. MRPK is defined at the firm level as the product of the capital share and turnover per fixed asset; MRPL as the product of the labour share and turnover per employee.